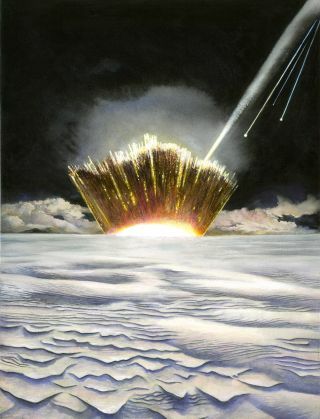 An artist's depiction of the meteorite smashing into the Greenland ice sheet. The scientists behind the new research believe the initial impact created a hole 12 miles (20 km) across, which rapidly collapsed to form the crater left behind. Scientists think they have spotted a giant impact crater hiding below Greenland's ice sheet. Here's how the discovery played out. Shown here: The strange crater is located along the northwest border of the Greenland Ice Sheet, where the Hiawatha glacier flows toward the sea. Hiawatha Glacier was named in 1922 in honor of the native American leader who co-founded the Iroquois Confederacy. Nearly a century later, scientists using advanced technology to peer under more than half a mile (nearly a kilometer) of ice discovered a hidden crater. The hidden crater stretches nearly 20 miles (31 km) wide. A prominent rim surrounds the depression. A view of the bedrock below the ice facing northwest, toward the sea, shows the terrain of the crater. In addition the rim surrounding the feature, the researchers behind the discovery also spotted a slight rise in the center. Such a rise is a fairly common feature in impact craters, but not diagnostic of how the gape formed. The Hiawatha Crater is so large that it could comfortably hold the French city of Paris within its rim. An artist's depiction of a large, iron-heavy meteor falling through Earth's atmosphere toward northwest Greenland. The researchers who spotted the crater used radar data gathered by airplanes to study the feature. That data suggested that the impact occurred somewhere between 3 million and 12,000 years ago, after the ice sheet had already formed. The scientists collected sediment carried out of the crater by the glacier. They looked for shocked quartz grains, which bear the traces of dramatic impact and melting from a collision. Lead scientist Kurt Kjær visited the Hiawatha Glacier to collect samples in hopes of learning how the giant crater formed below Greenland's ice. Read our full story on the hidden crater beneath Greenland!